TOKYO — Any fisherman knows that catching the big one often requires waking up very early. The same is true for seafood lovers angling to see the famous tuna auction at the Tsukiji fish market in Tokyo. As the biggest seafood market in the world, the Tokyo Metropolitan Central Wholesale Market is a top sight for tourists visiting Japan. But if you want to catch the rapid-fire auction where giant tuna sell for hundreds to hundreds of thousands of dollars, you need to get to the market at about 4 a.m. It's possible to visit solo without a guide, but hiring one will add to the experience, as English is rare at the market and novice eyes will miss much of the action. I booked a tour in advance with the Institute for Japanese Culture Experience & Education; not cheap at 21,000 yen or about $262 for one person (9,000 yen or $112 for each additional person) but it includes an onsite sushi breakfast. By 4:30 a.m., dozens of haggard tourists have lined up outside the information office at the main entrance to the market next to Kachidoki bashi bridge. Market officials then let everyone in to don bright yellow vests and watch a brief video warning them to remain in the marked-off viewing area, out of the path of the small erratic and dangerous electric vehicles called turret trucks that silently zip around the market and can run down unwary visitors. During the roughly 40-minute wait inside the center, guide Atsuko Yoshimura rattled off some of the impressive statistics of the market. More than 500,000 tons of seafood pass through each year, 20 swimming pools worth of water goes into the ice that vendors use each day, 42,000 people work at Tsukiji and the overall market is 32 football fields in size. She also demonstrated the hand gestures used by wholesalers to signal the price they want to pay for the fish. This helped me understand later as we watched an auctioneer sell a type of tuna called bigeye in seconds for several hundred dollars each. At 5:25 a.m., market officials hustled us through the bustling market, with giant trucks delivering and picking up supplies, the turret trucks careening wildly about in the dark and swarms of busy workers moving their products. The market also auctions shellfish, blowfish and fresh, unfrozen tuna. But the frozen tuna auction is the only one open to tourists. Visits are tightly controlled, apparently due to complaints in the past about interference from unruly visitors. In a large warehouse, hundreds of whole tunas frozen rock-solid to about minus-80 degrees Fahrenheit (about minus-60 degrees Celsius) lie on the concrete, sorted by type of fish. Labels on the side of the fish carry seller information, weight of fish and where it was caught. They come from all over the world, including from fishermen working out of Cape Town, Sydney, Tahiti and Boston. We watched as buyers carefully inspected the fish, shining a flashlight at the meat exposed by a flap sliced into the side of the fish near the tail. Buyers inspect the fat content and quality of the meat to decide on the value of the fish. The most highly prized are the bluefin tuna, which can weigh well over 600 pounds. Those giant fish filled one side of the large warehouse, while smaller bigeye and yellowfin filled the other. "We Japanese people love bluefin tuna. It contains more fat than other tuna," said Yoshimura. She waved over a fish wholesaler and he showed off what looked like a motorcycle license plate attached to a worn baseball cap. Each buyer wears a tag, which enables the auctioneer to keep track of sales. 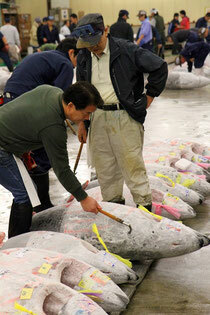 Asked if the sight of so many tuna made him hungry, the buyer, Shiro Kamoshita, chuckled. "I love eating the tuna, but it is business. I save the best for my clients," he said, as Yoshimura interpreted. Quickly, the auction got under way, with a brown-capped man ringing a bell and climbing on a step stool near the bigeye tuna. Tourists craned their necks to watch and quickly snapped photos. One tourist using a camera with flash was quickly taken to task. 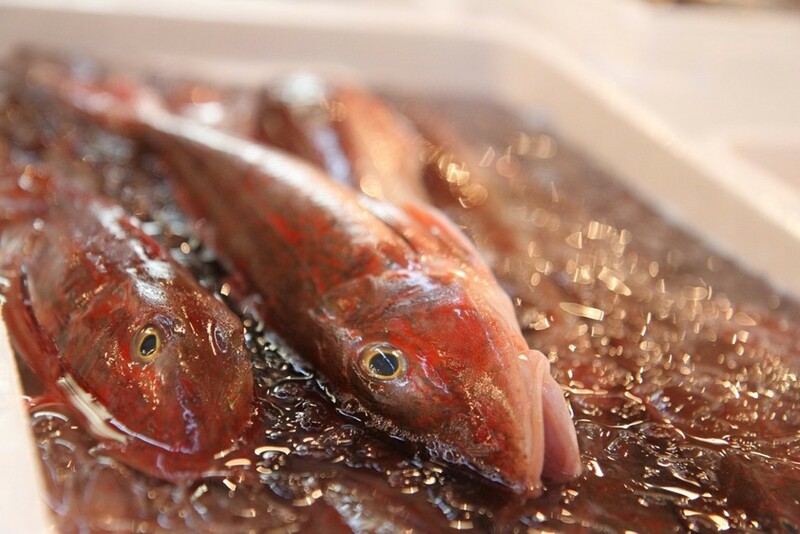 It only takes seconds for each fish to sell, as buyers flash hand signals to show the price they will pay. Within minutes, the bigeye were sold and buyers were daubing paint on the sides of their purchases. As gaffe-wielding workers hauled the frozen fish away, market officials herded the first group of tourists out and the second group headed in to see the bluefin auction. After the tuna auction, tourists often catch a sushi breakfast at tiny restaurants on the market grounds. A key to picking the right spot is eyeing the number of patrons wearing black rubber knee-high boots. If the market workers frequent an establishment, it has to be good. The restaurants line narrow streets, and it's possible to walk in the alleyways behind the restaurants and watch the food prepared in the kitchens, which are open to the alley. At 9 a.m., the intermediate wholesalers market opens to visitors. It is a riot of colors and action, with workers filleting giant tuna with long sword-like knives, others using band saws to cut up the rock-solid frozen fish, sellers arranging amazingly precise displays of every type of sea life (both live and dead) imaginable and throngs of buyers and workers moving seafood through the market. And, incredibly, the air is fresh, with little smell of fish. It's an indication of just how quickly the fish move through. Chances are any visitor to Japan will eat a huge variety of seafood during the stay. 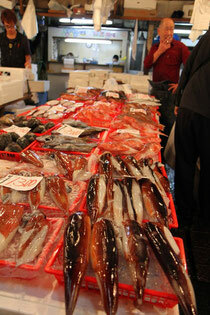 A visit to Tsukiji lets tourists see the incredible logistics that deliver that food to the plate. TSUKIJI FISH MARKET: 5-2-1 Tsukiji, Chuo-ku, Tokyo. 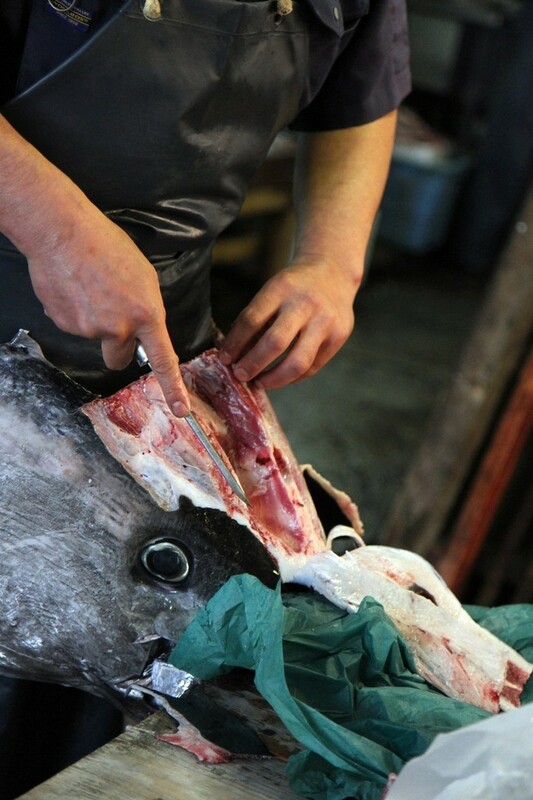 Guidelines for visitors: http://www.shijou.metro.tokyo.jp/english/market/tsukiji.html . First come, first served, daily, with lines forming for registration well before 4:30 a.m.
TOURS: Institute for Japanese Culture Experience & Education — http://www.ijcee.com/english/fascinate/walk/tsukiji_early_short.html — offers guided tours of the Tsukiji fish market auction in English, 21,000 yen (about $262) for one person, 9,000 yen ($112) per additional person. Includes sushi breakfast at onsite restaurant. Not available Wednesdays, Sundays or holidays; check schedule online. Reservations must be made in advance but there are cancellation fees.